Written for Coursera (MOOC) Class ‘Global Sustainable Energy, Past, Present and Future‘ by the University of Florida (June 2013). The United States of America was the industrial and cultural powerhouse of the 20th century. It dominated world trade and was a deciding influence on the outcome in two World Wars. It has been the beacon for democracy and free market trading for 100 years. However, as we progress through this next century of greater global equity, the USA has to navigate some major cultural hurdles and moderate its runaway consumer society to maintain its leadership role in international affairs. The US economy, with a nominal GDP of $15.7 trillion (a quarter of the global total) is by far the world’s largest. China has the second largest with a GDP of $8.2 trillion. The European Union is marginally bigger, economically, than the USA with a combined GDP of $16.4 trillion [1.0]. The Academic Institutions of the USA provides University education to over 700,000 [1.1] international students annually as well as providing more than 30% of Americans with bachelor degrees [1.2]. The USA in this respect has been instrumental in preparing the conditions for an era of global integration and a more enlightened approach to solving global issues. The USA has led the world in computer technology, to the development of virtual world forum that is the internet. Here the potential for clearer communication and understanding between countries and cultures promises a future of global solutions to global problems. However, with economic success has come issues related to over consumption, to arguably unsustainable levels. These issues have global as well as national implications. It is in liquid form at ambient temperature it is easily transported and stored. It proved to be a very useful transportation fuel. Up until the past few decades, it was abundant and easy to extract and process into usable products. Widespread and intensive consumption has led to dwindling reserves and high pollution levels which are contributing to global warming and climate change. The unsustainable nature of oil as a fuel from both a resource and environment perspective has led to a search for alternatives. In order to reduce reliance on imported oil and also to reduce CO2 emissions, the USA is looking to find efficiency savings by: improving mass transit systems, encouraging citizens to reduce personal consumption, and funding research to improve the fuel efficiency of vehicles. 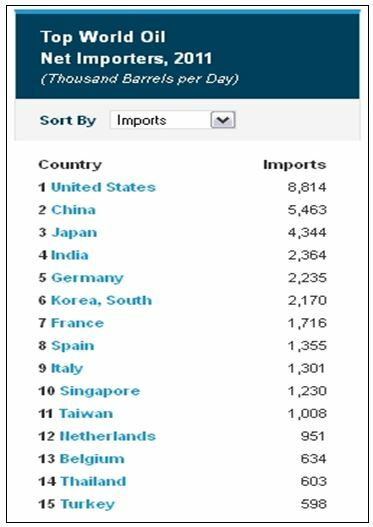 The USA is a net importer of oil and is the largest consumer of oil in the world, 18.9 million barrels per day in 2011 [2.1]. Consumption has grown steadily with improved standards of living, increasing throughout the 1980s and 1990s even as production levels fell. Inefficient fuel consumption habits were adopted during times of prosperity with a cheap supply of oil. Between 1985 and 2005 production figures steadily declined. During this period, the growing oil deficit prompted government to focus on ways to reduce consumption. However, recent developments in ‘fracking’ technology and discoveries of shale oil deposits in Montana, North Dakota and Texas have caused a rebound in US oil production. There is now talk of another oil boom and widespread challenges to ‘Peak-Oil’ economic theory. The value of developing more sustainable energy sources from an environmental and climate change perspective remains as motivation to support research in alternatives to oil and other fossil fuels. Furthermore, recent discoveries of oil deposits may only temporarily bolster home production. Reduce reliance on Imported Oil. Reduce overall consumption of Energy. Encourage more use of Mass Transit, especially in Urban Areas. Develop better Alternative Fuel vehicles. Develop more Fuel Efficient conventional vehicles. Limit use of Oil to where alternatives are difficult. Oil production fell from over 11 million barrels per day in 1985 to just under 8.5 in 2005. With the discovery of the Bakken (North Dakota/Montana)and Eagle Ford (Texas) shale oil deposits and successful fracturing techniques, production is again rising and may divert focus from efficiency efforts [2.1]. 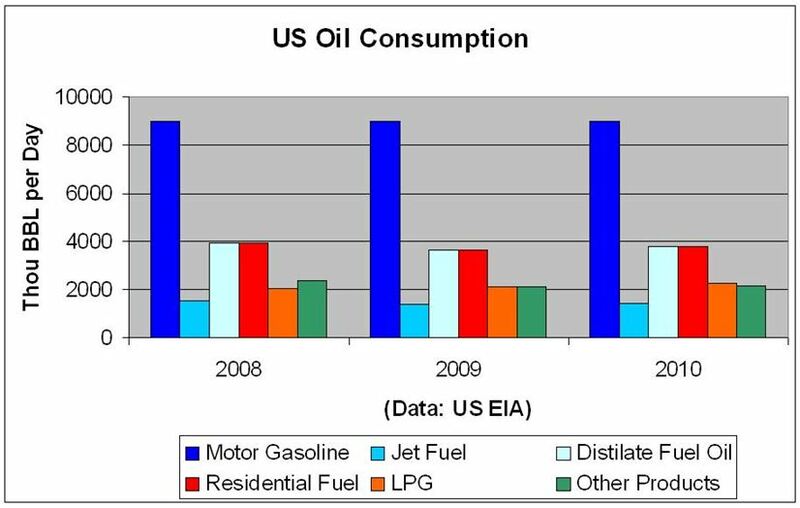 According to EIA, the USA was by far the largest consumer of oil in the world in 2011, with 18.9 million barrels per day. It has been the largest consumer since oil was used on a commercial scale in the early 1900s. China, a country of 1.3 billion people, compared with 317 million in the US, was the second largest consumer with nearly half US consumption of 9.8 million barrels per day. In the USA the equivalent per capita consumption is 2.5 gallons per day, and in China 0.3 gallons. In 2011, the USA was the third largest producer of oil with 10.14 million barrels per day, behind Saudi Arabia (11.15 Mbbl/day) and Russia (10.24 Mbbl/day). In 2011, the USA had declared proven reserves of 23.3 billion barrels of oil. The most oil rich countries were Saudi Arabia (262.6 billion barrels) and Venezuela (211.2 billion barrels). However, there is some doubt over these top reserve figures, as OPEC countries reserve estimates have been erratic in the past. According to Mining Weekly, they could be overstated by as much as 70% [2.2]. 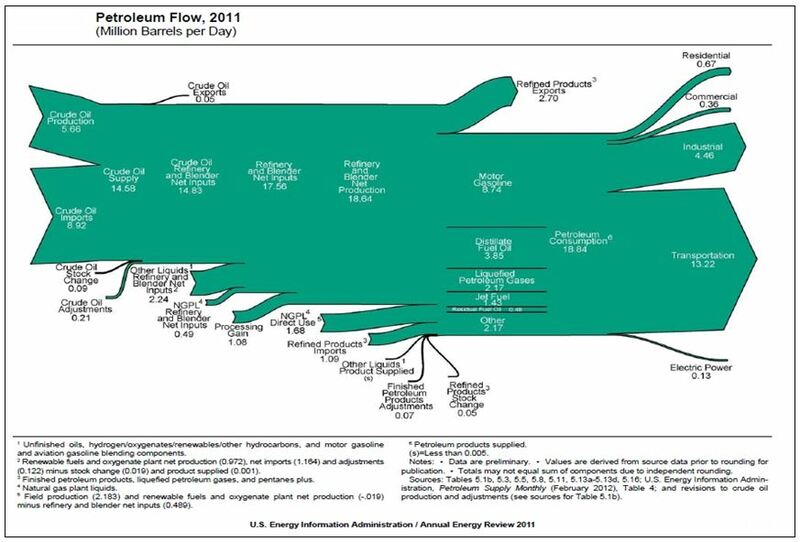 The US EIA flow diagram shows the inflow and outflow of US Oil in 2011. The large consumption outflow for Transportation Fuel is most notable, as well as the various import inflows. 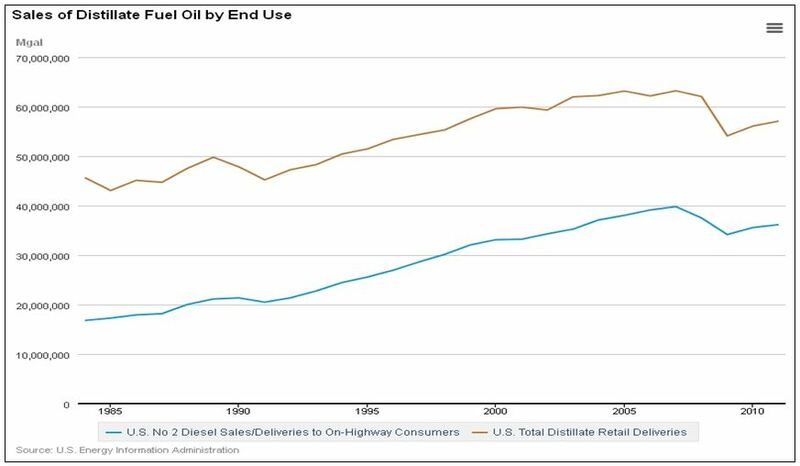 The largest consumption of oil in the USA is by motor vehicles. On average, motor gasoline accounts for 37% of all oil use. Distillate fuel oil, which includes diesel, and residential fuel oil both average just above 15% each. Aircraft fuel (Jets), consume about 6% of the total. Liquefied Petroleum Gas (mostly propane and/or butane), about 9% of consumption, is used mainly in rural heating and cooking in areas with no mains gas supply. It is also used as a vehicle fuel as an alternative to gasoline and diesel, only 0.1% of US LPG consumption in 2005. As can be seen in the map and table below, the average rate of car ownership in the USA is about 0.77 cars per people, including children! So in actual fact adults own more than one car each. 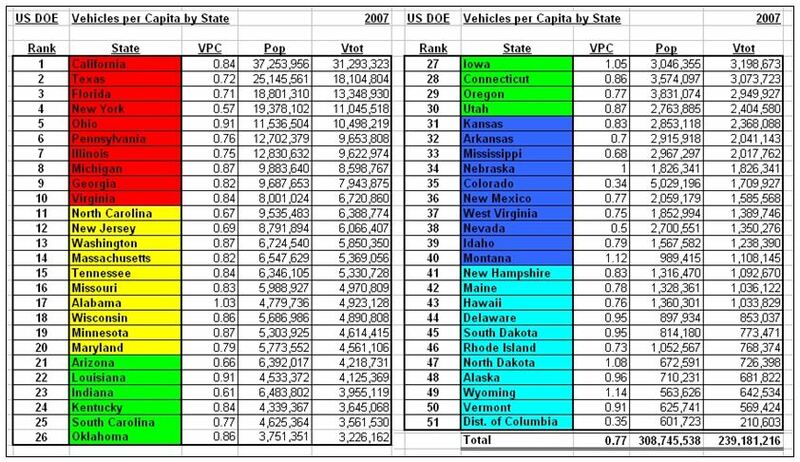 The states with a greater average than 1 car per capita are Wyoming, Montana, North Dakota, Iowa, Alabama and Nebraska. These states are largely rural of low population density and associated with agriculture as a primary economic activity. These factors help to explain the higher reliance on personal vehicles. 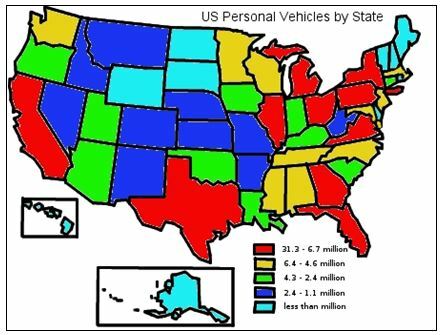 The states with the highest total amount of vehicles are also the most populous, but with ownership rates of between 0.57 for New York and 0.91 for Ohio. The high population density in New York City coupled with good mass transit explains the low vehicle rate. The states with the lowest incidence of car ownership are: Colorado (0.34), Washington DC (0.35), Nevada (0.5), New York (0.57) and Indiana (0.61). These figures give some indication of national dependence on personal vehicles and subsequent consumption levels of petroleum [2.3]. New York City is a good example of how in densely populated urban areas, effective mass transit is possible and preferable to car use. It is the only city in the US with a mass transit commute rate greater than 50%. 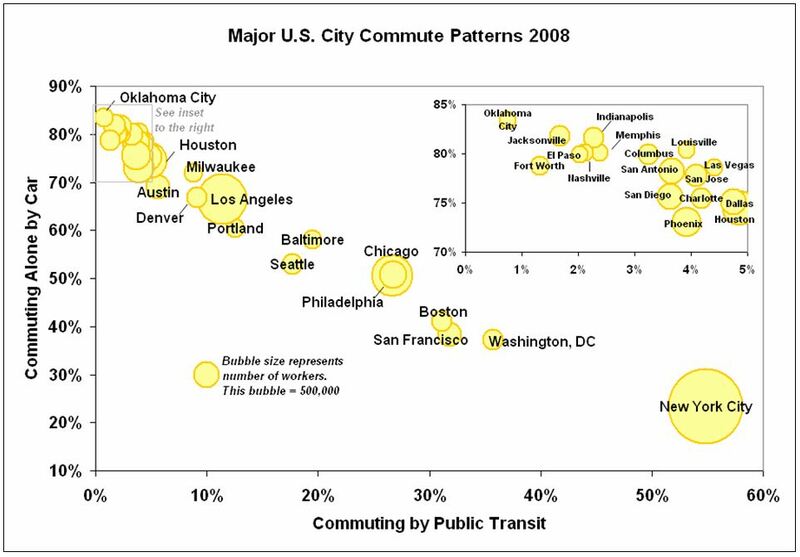 The bubble graph below shows the urban centers with highest mass transit usage. Ranging from Number 1 to Number 6, distillate fuel oil is produced in refineries from crude oil. Numbers 1 to 3 are diesel fuel with hydrocarbon chain lengths of 9 to 20. Numbers 4 to 6 are heavy fuel oils used mainly for heating, with chain lengths of 12 to 70. About half of all distillate consumed in the USA is as diesel in road transportation, 36.2 of the 57.1 billion gallons used in 2011. Other main end users include: Residential, Commercial, Industrial, Farm, Railroad, Construction and Shipping, each using between 2 and 3.6 billion gallons annually [2.5]. As can be seen from the Department of Transportation statistics for 2010, 68% of all freight is transported in trucks on the highway, and only about 10% by Railroad. Whilst trucks offer greater flexibility, since road networks are more widespread and less regulated, railroads are a more fuel efficient mode of transport. Furthermore, Department of Transportation figures indicate that in recent years, railroads are becoming more fuel efficient, but truck efficiency remains fairly static. 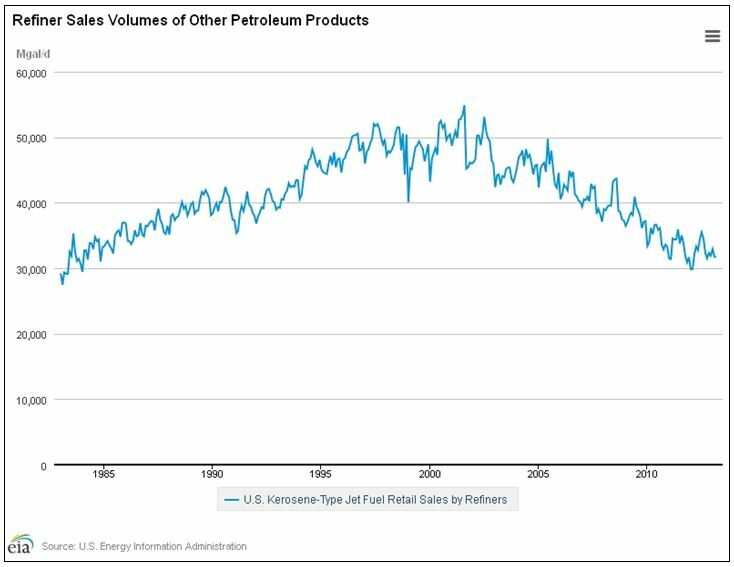 As illustrated in the graph below, consumption of Jet fuel rose from the mid 1980s to a peak in August 2001, and then falling again to a current rate of consumption of 31.6 billion gallons per day (March 2013). 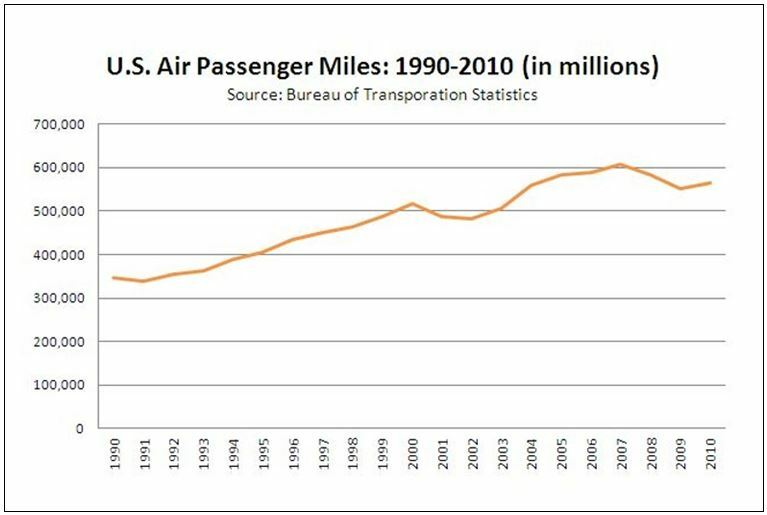 Passenger miles in the US have steadily risen annually since 1990, except when consumer confidence was shaken by the terrorist attacks of September 2001 and the recession hit in 2008/9 causing an initial decrease US citizen departures, followed by a drop in International visitors to the USA [2.6]. As can be seen in the graphs below, US air freight growth has remained fairly flat, apart from the same recession dip in 2009. 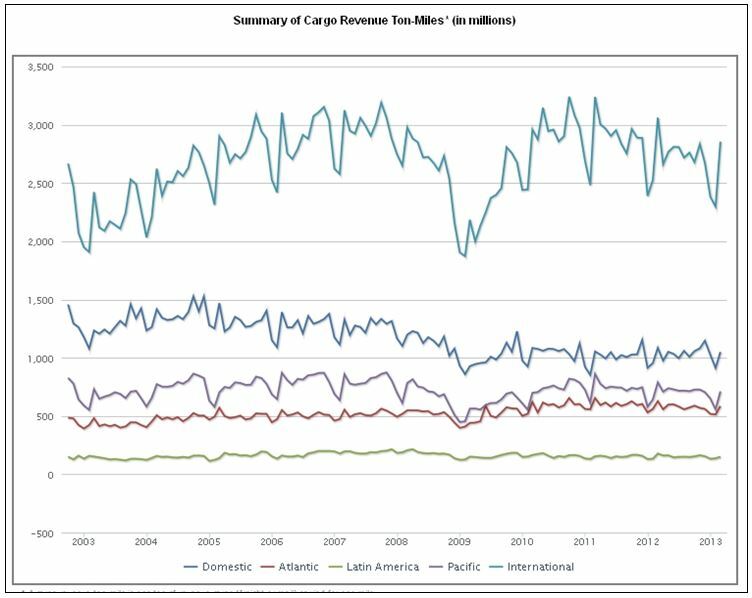 The combined freight and passenger activity trend upwards since peak air fuel consumption in 2001. This suggests that aircraft and airlines have become more efficient in recent years. Information technology has help reduce the quantity of unallocated seats by use of ‘smarter ticketing’, and fuel management software has increased efficiency by about 4.5% [2.7]. Also, additions of newer aircraft, which are designed to be more efficient, are helping reduce overall consumption. Residential fuel oil is used for heating, mainly in remote and rural areas without access to mains gas supply. 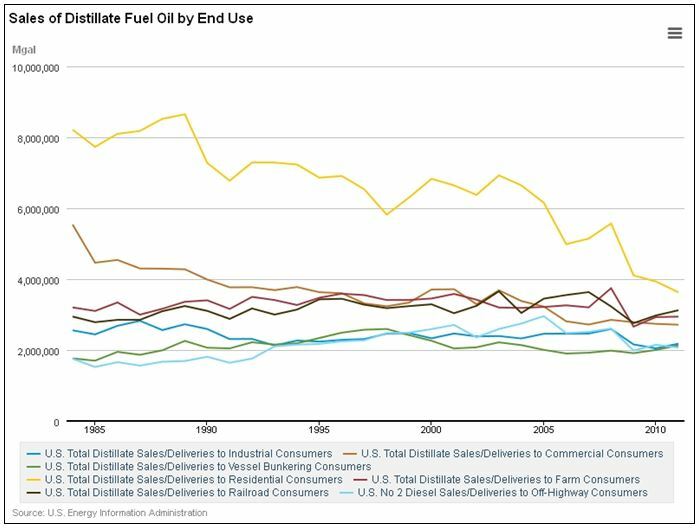 Consumption fell from 8.2 billion gallons in 1984 to 3.6 billion in 2011 (see graph in distillate fuel section). This reduction in use is largely due to price increases, encouraging consumers to economise and seek alternative and more affordable heating fuels [2.8]. Similarly to Fuel Oil, LPG is mostly used in remote areas away from mains natural gas. It is used as an alternative fuel in modified vehicles, but not in significant numbers in the USA. In order to discourage vehicle fuel inefficiency, the US government introduced ‘Gas Guzzler’ tax measures in the 1978 ‘Energy Tax Act.’ New cars are tax assessed according to their fuel economy [2.9]. Tax credits are available, worth up to $7,500, towards the purchase of an electric or hybrid vehicle. To provide better clarity, Vehicle Fuel Economy Labels have been introduced by the US Environmental Protection Agency. They provide clear information about the fuel performance of the vehicle including expected MPG, tailpipe emissions, and expected fuel costs. These labels also apply to vehicles which use alternative fuels such as electric and hybrids with energy conversion information expressed in terms of equivalent MPG. 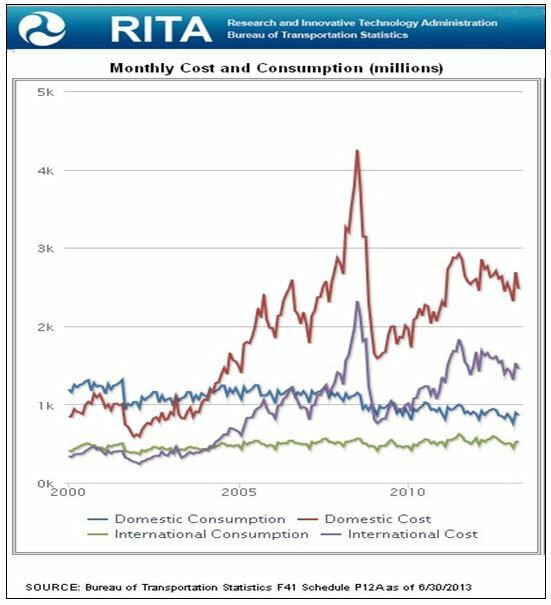 Overall consumption of alternative transportation fuels increased almost 13% in 2011, to a total of 515,920 thousand gasoline-equivalent gallons. In alternative-fueled vehicles, consumption of ethanol (E85) jumped 52% from the prior year’s consumption to 137,165 thousand gasoline-equivalent gallons in 2011, a reflection of the increase in overall inventory of E85-capable vehicles. While inventory and fuel use in automobiles continues to increase, the rise in the use of medium duty vans had a larger impact on fuel consumption due to their higher rate of consumption and, in contrast to light duty vehicles, they are more likely to be utilized as an alternative-fueled vehicle than a traditional gasoline-fueled vehicle. Many fleets meet petroleum reduction requirements by using biodiesel rather than alternative fuels. Changes in biofuel subsidies, specifically replacement fuels like ethanol and biodiesel, affect consumption trends in the marketplace. With the reinstatement of the biodiesel tax credit and the requirements under the Renewable Fuel Standard, consumption of biodiesel grew almost 240% between 2010 and 2011. Consumption of ethanol in gasohol (E10) remained flat between 2010 and 2011 since almost all gasoline in the United States is now blended with 10 percent ethanol. This “blend wall” (the maximum amount that can be blended into standard gasoline without requiring different equipment, warranties or infrastructure) has shifted more ethanol into the E85 sector. 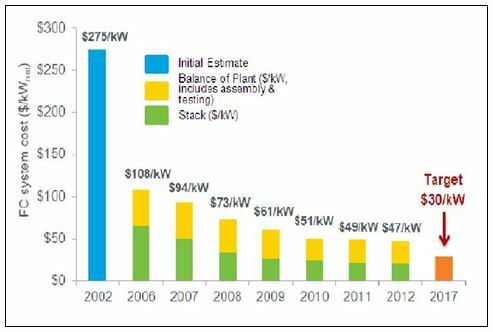 Consumption of electricity in light duty automobiles increased by almost 36% with a total of 7,635 thousand gasoline-equivalent gallons in 2011 compared to 4,847 thousand gasoline-equivalent gallons in 2010. While the majority of electric vehicles in use remains in the low speed vehicle category (45,397 of the total 67,296 electric vehicles in use 2011), inventory of electric automobiles increased rapidly to 10,245 automobiles in 2011, primarily in the private sector where electric vehicles are becoming more widely available to private households. Driving less aggressively, less speeding, braking and accelerating, has the effect of improving fuel efficiency. Driving above 50mph begins to drastically increases fuel consumption. Using cruise control is a good way of moderating speed. Excess weight in a vehicle results in higher fuel consumption. By ensuring that unnecessary items are removed from the trunk and inside the vehicle compartment, this can be minimized. By avoiding peak-hour traffic you can better control fuel efficiency due to reduced braking and engine idling. Car sharing is an effective way of reducing overall fuel consumption, and using mass transit, bus or train, is even better. Sharing is encouraged in many towns and cities by the provision of high occupancy vehicle lanes which are for exclusive use by shared vehicles. They are usually less congested and allow easy transit [2.10]. Research and development of Hydrogen as a motor vehicle fuel is being prioritized as it has great potential to replace petroleum. The technology is based on ‘fuel cells’ which use hydrogen and oxygen to produce electricity to power the vehicle. As well as reducing dependency on oil, this is a green technology which emits no greenhouse gasses or harmful pollutants from the vehicle. However, producing hydrogen fuel is energy intensive, and depending upon this fuel source, some emissions are possible. Some design challenges currently being tackled are: vehicle range and fuel cell durability and reliability. Other issues, in common with most alternative fuels are: high vehicle cost and fuel supply infrastructure. These are likely to become less of an issue with increased market penetration and consumer uptake. Ethanol and biodiesel are produced from vegetation and some animal fats. These fuels can be used in conventional vehicles with little or no conversion required. Ethanol is an alcohol which is fermented from crops such as corn, trees and gasses. Gasohol (E10) is a 9:1 gasoline/ethanol blend available throughout the USA and can be used directly in most conventional vehicles. Flex-fuel vehicles have engine and fuel system modifications which allow them to run on E85, which is a 80% ethanol rich, gasoline blend. There are currently about 2000, and growing, filling stations in the US providing E85. Since Ethanol has a lower energy content than gasoline, the mpg is lower. However, using ethanol lowers dependency on imported oil with indigenous ethanol production. Biodiesel is also produced in the USA. It is manufactured from vegetable oil and animal fats, including recycled restaurant grease and oil [2.12]. 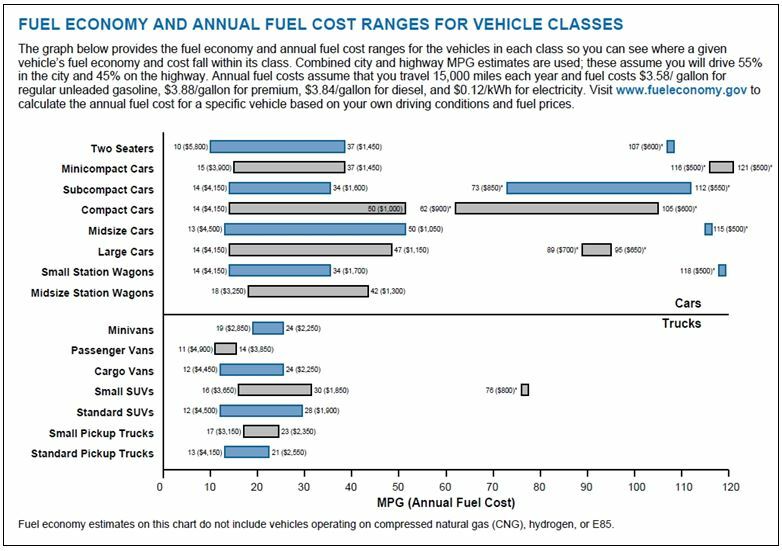 In the chart below, from US Department of Energy/EPA ‘Fuel Economy Guide 2013’, the fuel economy ranges of different class vehicles are provided. 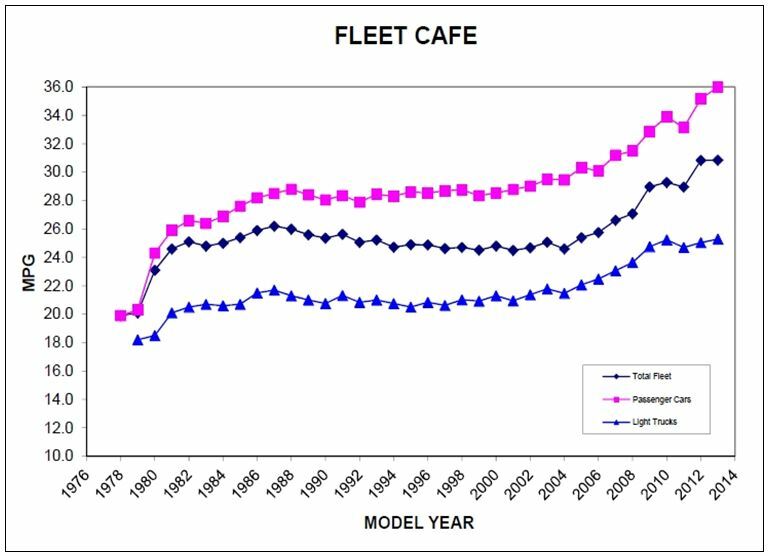 The Corporate Average Fleet Economy (CAFE) was introduced by US Congress to reduce energy consumption in 1976. It continues in collaboration with the National Highway Traffic Safety Administration to set standards and increase the fuel economy of cars and light trucks. The CAFE figures shown in the graph above indicate that overall fuel economy of road vehicles in the USA is steadily improving. 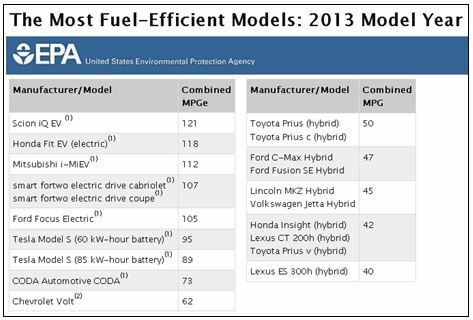 The EPA data in the table below illustrates the current potential MPG ratings of vehicles currently available. British Airways Info: 747-400 Aircraft cruises at 576 mph (927 km/h), burning 12,788 liters (3378 US gallons) of fuel per hour. It carries 409 passengers when full. With 75% occupancy, each passenger is carried 22.2 km for each liter of fuel used (52.2 miles for each US gallon of fuel burned). This fuel efficiency exceeds that most all cars, but only if the driver is traveling alone. Land based travel in multiple occupancy vehicles is much more efficient, but are a lot slower over greater distances. Short haul flights offer reduced advantages when airport transit time is considered. The Intergovernmental Panel on Climate Change is the UN established scientific body which assesses the risks associated with climate change caused by human activity (greenhouse gas emissions). Significant improvements in aircraft fuel efficiency have been achieved since the dawn of the jet age in commercial aviation. Historically, these improvements have averaged 1-2% per year for new production aircraft. These advances have been achieved through incorporation of new engine and airframe technology. Changes have included incremental and large-scale improvements. Examined over several decades, however, they represent a relatively steady and continuous rate of improvement. A similar trend is assumed when fuel efficiency improvements are projected forward to 2050. In the ten year timeframe to 2023, using 2011 EIA figures for Oil Consumption as a 2013 baseline, projected reductions are shown in the table below (units: million barrels per day ). As seen in the previous section, work related travel makes up 27.5% of all personal vehicle miles. More than 75% of commutes are in single occupancy vehicles, which is a very inefficient mode of transportation. Efficiencies can be made by increasing shared journeys, and making use of mass transit. Reducing work related travel by working from home and making use teleconferencing is becoming more popular and is becoming easier with improved internet facilities. Investment in improved mass transit: bus and light railway systems, should be targeted in the more densely populated urban areas. Large cities should both develop state of the art transit infrastructures which improve travel times by reducing traffic congestion and pollution. This has the added benefit of reducing overall fuel consumption. I have set a target of 30% efficiency savings in the Work Travel category. The remainder of personal vehicle transportation is for social, family and personal activity. Again, much of this is by single occupancy vehicle. The inefficiency of use in this category is linked to the relatively low cost of gasoline in the USA. Other OECD countries have imposed high fuel tax to discourage over consumption. I believe that this is necessary in the USA to encourage use of alternative modes of transport and reduce passenger miles. I have set a target of 30% efficiency savings in the Other Travel category. Poor driving technique and aggressive driving causes high fuel consumption. Driving too fast (above 50 mph), excessive accelerating and frequent braking all increase fuel consumption. Many people are unaware of the extent that poor technique has on fuel efficiency and cost. Poor car maintenance can also reduce fuel efficiency. Under inflated tires and dirty fuel and air filters all increase fuel consumption. A campaign of better public awareness coupled with increased fuel tax should encourage drivers to save on fuel by adopting better practice. It has been proven that efficiency savings of between 20% and 30% are possible by these measures alone. I have set a target of 15% efficiency savings in the Driving Technique category. The USA starts from a relatively low average efficiency figure of 23 mpg. This reflects the preference for larger vehicles with larger engines which has been encouraged by low fuel prices. With improved general awareness of oil supply issues, environmental impacts and potential increases in fuel price, there is greater focus on fuel economy. Since the technology exists already to significantly improve the national average for vehicle fuel efficiency, the majority replacement of the US fleet is possible within ten years. I have set a target of 25% efficiency savings in the Driving Technology category. Electric powered cars and Hybrids are available now and are being further developed to improve range and performance. The charge station infrastructure is growing steadily throughout the country. Hydrogen fuelled cars are also in development and entering the market. Both of these technologies can be powered by clean and renewable energy, depending upon the means of electricity generation. Eventually, as renewable power displaces fossil fuel in electricity supply, low carbon transportation is possible. In the given timeframe significant market penetration is possible. I have set a target of 20% efficiency savings in the Alternative Fuelled Vehicles category. Biofuels such as biodiesel and bioethanol are produced from vegetation and recycled animal fats. They are already in widespread use in conventional vehicles, requiring little or no modification to engines or fuel system. I have set a target of 10% efficiency savings in the Biofuel Displacement category. The current dominance of Highway Trucking in freight transportation in the USA offers marginally greater convenience with significantly lower fuel efficiency, as compared to Railroad transportation. Long term, the majority of long distance freight should be moved by rail, wherever possible, with trucks and vans making up the shortfall in the connecting miles between rail terminals and customers. I have set a target of 25% efficiency savings in the Freight Truck to Rail category. Similarly as with light vehicles, a focus on better fuel efficiency within the road freight industry in both technology and practice should yield significant fuel efficiency savings. However, since this is a commercial venture under greater scrutiny, efficiency savings are expected to be lower. I have set a target of 10% efficiency savings in the Truck Fuel Efficiency category. The portion of distillate fuel oil used as a source of heating is an inappropriate use of liquid fuel. Residents and business owners that use oil as a heating fuel should be encouraged to convert to cleaner and more appropriate systems such as wood pellet stoves or heat pumps in combination with micro renewable technology. I have set a target of 15% efficiency savings in the Truck Fuel Efficiency category. Air travel is the only practical means of long distance and inter-continental travel. It is also an inefficient and highly polluting mode of short to medium distance travel. Many US domestic short haul routes are difficult to justify as total travel time between destinations when using more fuel efficient alternatives such as trains, busses and even cars are almost equivalent. Overall I have set a target of 25% efficiency savings in the Overall Air Traffic category. Short haul flights in the USA account for 40% of total passenger miles. I have set an additional target of 25% efficiency savings in the Short Haul Air Travel category. Advances in airliner efficiency due to better management systems, lightweight composite materials and improved airframe and engine design all promise continuous improvement in fuel efficiency. I have set a target of 10% efficiency savings in the Improved Air Fuel Efficiency category. Total efficiency savings amount to 10.5 million barrels of oil per day, equivalent to almost 80% of current Transportation Oil, by 2023. A huge potential saving in terms of foreign imports and the trade deficit, plus energy security. These measures also reduce the national CO2 emissions significantly. The motor car is embedded deep in American culture and folklore. It has been a symbol of freedom and independent lifestyle for generations. This will be a difficult belief to alter, especially in adults who have grown up with these ideas and patterns of behavior. Public transport has in some regions been associated with poverty and traveling on busses and trains seen as second best to riding in ones own personal vehicle. Furthermore, with lack of investment and adequate maintenance many of these modes of transport have become worn out looking, dirty and uncomfortable. The inconvenience of waiting for irregular arrivals of busses and trains is also off-putting. The nature of the sprawling built environment in the majority of US conurbations, designed around car users, makes travel by foot or bicycle impractical on a daily basis. A lack of public transportation in many areas reinforces the requirement to use a car. The intercity/interstate network of railroads is patchy across the USA, with many lines that do exist dedicated to freight only. 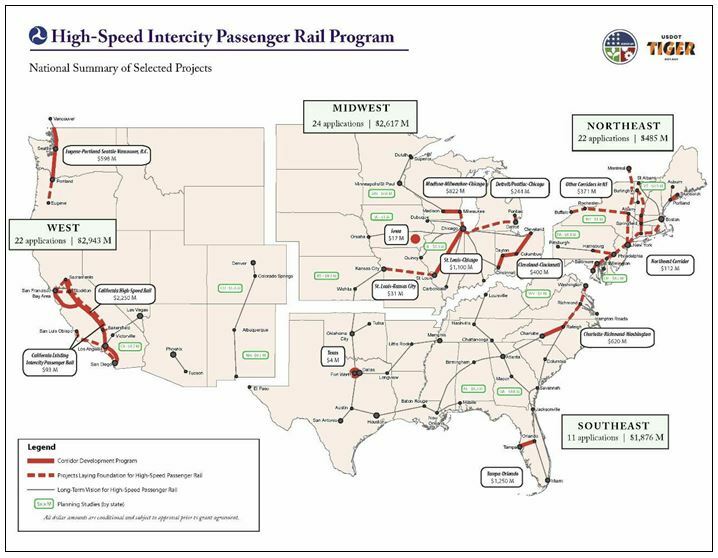 The extent of the high speed network is illustrated in the map below. California and the north east is connected (though not to each other! ), but elsewhere service is poor. As illustrated in section 2, only NYC has a commute rate by mass transit greater than 50% and according to the US Department of Transportation, less than 5% of national commuting is by mass transit. A concerted effort with government investment and support to upgrade public mass transit systems in all the countries large cities to both improve the quality and image of this highly efficient mode of transport would improve overall fuel economy. Similarly, in less densely populated areas, upgrades of bus and rail networks would encourage people to use alternative and more efficient transportation. There will be resistance from those with a vested interest in the status quo from a business point of view. The main groups that may strongly lobby against these reforms are the oil companies, conventional vehicle manufacturers and associated support businesses, and road freight contractors. However, in the greater interest of the nation and the planet things must change. There are many people who deny the near possibility of Peak-Oil. They may genuinely believe this, or may just want to prolong a particular lifestyle. Recent discoveries of new oil reserves are used as evidence that oil will remain plentiful. However, eventually it will become uneconomical and scarce to meet the needs of the masses. Each year the evidence linking mans consumption of fossil fuels to global warming and climate change becomes stronger. The data set builds as more research is supported and carried out across the world. 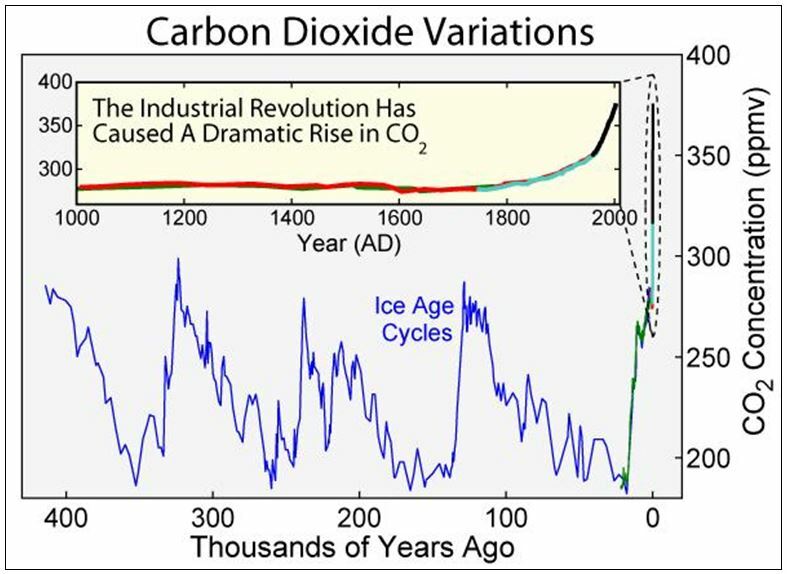 Corroboration of data, theories and climate models appears to support this. CO2 levels have reached 400 parts per million for the first time, recorded at the Mauna Loa Observatory in Hawaii on 10 May 2013. This is a great cause for concern, which should motivate change in consumption habits alone. Since the US is such a super consumer of oil, significant reductions to the degree discussed here will have an impact on global markets. Furthermore, the USA is not alone in transitioning away from heavy dependence on oil as a transportation fuel. The trend in developed countries has already begun in this direction. If the USA converts in large enough numbers to alternative fuel sources over the next decade, along with Canada, Europe and Japan, demand for oil will drop, and so will the price. Developing countries and regions with increasingly affluent populations may continue prop up the oil market, if they continue to adopt transportation modes which run on oil. China, Russia, India and Brazil have growing economies and the demand for new vehicles and consumer goods in general is rising accordingly. Eventually though, sustainability and indigenous energy factors will persuade all countries to limit reliance on oil. The relative strengths of OECD reduction and BRIC and other developing regions increase in oil consumption will determine the overall consumption demand. This is balanced against availability and extraction costs of harvesting oil. The global price of oil is sensitive to fluctuations in supply and demand. Historic data has shown this. The figure, from WTRG Economics [5.0] below, shows how oil prices rose when supply was reduced and fell when supply was plentiful. 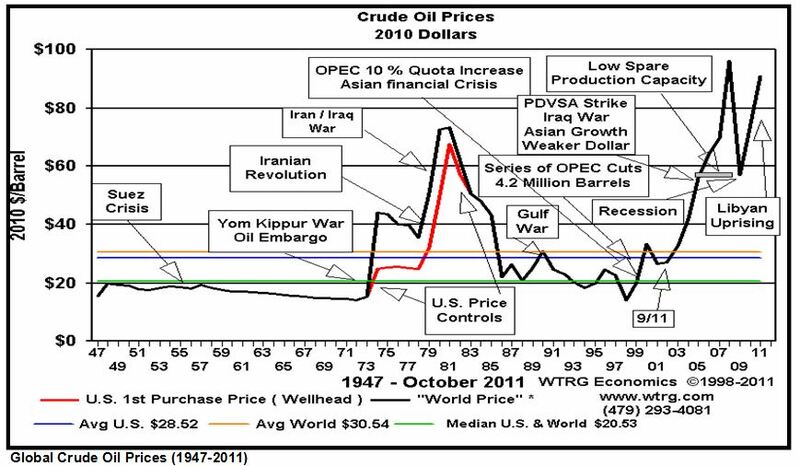 As can be seen, various disturbances in parts of the world which are large producers of oil, such as the Suez crisis in Egypt (small effect in comparison to current prices, but significant at the time), both Gulf wars and the Iranian revolution caused prices to fluctuate. Shortages caused by interrupted supply causes prices to rise, e.g. OPEC restrictions and Yom Kippur War embargo. Over-production and supply causes prices to drop. The oil boom of the 20th century has harvested the ‘low hanging fruit’, in depleting the easier to find and extract oil deposits on land and in areas of easy terrain close to consumer countries, like Texas. Discoveries in the Middle East were at times unavailable to the markets due to political instability. Offshore fields such as the North Sea and the Gulf of Mexico were technically more difficult to locate and exploit, with increased production costs. Recent shale field and tar sand discoveries have seen higher energy input requirements, and some additional processing steps to convert the crude to usable product. So future deposits are likely to need more capital investment and carry more financial risk, before oil can be extracted. Renewable technologies and alternative fuels are beginning to fall in price as they gain market share and consumers benefit from mass manufacture and economy of scale savings. Burning oil as a fuel is environmentally undesirable and an unsatisfactory use of a finite resource. Once transportation requirements have been met by more sustainable and eco-friendly sources such as wind, wave and solar, oil will be best used as a feedstock for materials in manufacturing industry. Here is a summary of the major energy issues identified in this paper. Also summarized are, the major points made regarding the implementation of actions to transform petroleum consumption and recommended steps in the plan to transform US transportation fuel consumption over the coming decade. [2.9] US EPA ‘Energy Tax Act.’ New cars are tax assessed according to their fuel economy.